ROME - Italian police fired tear gas and water cannons Saturday in Rome as violent protesters turned a demonstration against corporate greed into a riot, smashing shop and bank windows, torching cars and hurling bottles. The protest in the Italian capital, which left dozens injured, was part of the "Occupy Wall Street" demonstrations against capitalism and austerity measures that went global Saturday. Tens of thousands nicknamed "the indignant" marched in major cities across Europe, as protests that began in New York linked up with long-running demonstrations against government cost-cutting and failed financial policies in Europe. Heavy smoke billowed into the air in downtown Rome as a small group broke away from the main demonstration and wreaked havoc in streets close to the Colosseum. Clad in black with their faces covered, protesters threw rocks, bottles and incendiary devices at banks and Rome police in riot gear. Some protesters had clubs, others had hammers. They destroyed bank ATMs, set trash bins on fire and assaulted at least two news crews from Sky Italia. TV footage showed police in riot gear charging the protesters and firing water cannons at them. Several police forces and protesters were injured, including one man trying to stop the protesters from throwing bottles. TV footage showed a young woman with blood covering her face, while the ANSA news agency said one man had lost two fingers when a firecracker exploded. In the city's St. John in Lateran square, police vans came under attack, with protesters hurling rocks and cobblestones and smashing the vehicles. One police van was set ablaze, but the two people inside were able to abandon the vehicle. Peaceful demonstrators who could not leave the square climbed up the staircase outside the Basilica, one of the oldest in Rome. Rome Mayor Gianni Alemanno blamed the violence on "a few thousand thugs from all over Italy, and possibly from all over Europe." He said some Rome museums were forced to close down because of the violence. Some protesters also trashed offices of the Defense Ministry and set them on fire, causing the roof to collapse, reports said. Police were out in force as up to 100,000 protesters had been expected a day after Premier Silvio Berlusconi barely survived a confidence vote in Parliament. Italy, which has a national debt ratio second only to Greece in the 17-nation eurozone, is rapidly becoming a focus of concern in Europe's debt crisis. "People of Europe: Rise Up!" read one banner in Rome. Some peaceful demonstrators turned against the violent group and tried to stop them, hurling bottles, Sky Italia and ANSA said. Others fled, scared by the raw violence. ANSA said four people from an anarchist group were arrested early Saturday morning, with police seizing helmets, anti-gas masks, clubs and hundreds of bottles from their car. Elsewhere, bright autumn sunshine and a social media campaign brought out thousands across Europe. In Frankfurt, continental Europe's financial hub, some 5,000 people protested at the European Central Bank, and some were setting up a tent camp aiming at permanently occupying the green space in front of the ECB building. Wikileaks founder Julian Assange spoke to about 500 demonstrators outside St. Paul's cathedral in London, calling the international banking system a "recipient of corrupt money." U.K. police contained most London demonstrators in the streets around the cathedral, near the city's financial district. Protesters erected tents and asked supporters to bring them blankets, food and water as they settled down for the evening. Several hundreds more marched in the German cities of Berlin, Cologne and Munich and the Austrian capital of Vienna, while protesters in Zurich, Switzerland's financial hub, carried banners reading "We won't bail you out yet again" and "We are the 99 percent." In Brussels, thousands of marched through the downtown area chanting "Criminal bankers caused this crisis!" They pelted the stock exchange building with old shoes then marched on to the European Union sector. Protesters also accused NATO, which has its headquarters in Brussels, of wasting taxpayer money on the wars in Libya and Afghanistan, saying that one European soldier deployed to Afghanistan costs the equivalent of 11 high school teachers. In Helsinki, around 300 activists held a peaceful, creative rally with homemade signs and stalls full of art and food. In Spain, the Indignant Movement established the first around-the-clock "occupation" protest camps in cities and towns across the country beginning in May and lasting for weeks. Six marches were converging Saturday on Madrid's Puerta del Sol plaza just before dusk. 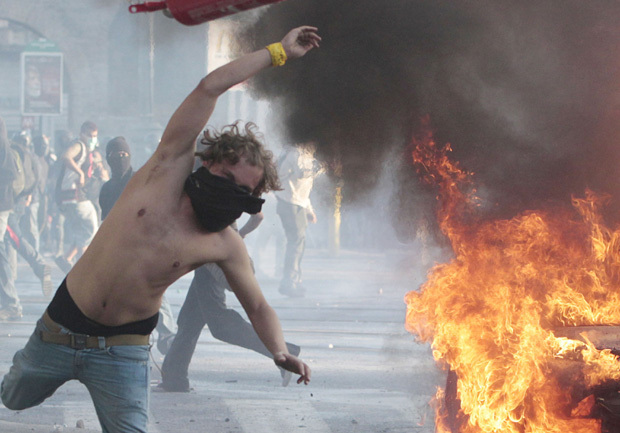 Portuguese angry at their government's handling of the economic crisis were protesting in downtown Lisbon later. Portugal is one of three European nations  the others being Greece and Ireland  that have already needed an international bailout. Across the Atlantic, hundreds gathered in Toronto's financial district, converging close to the Toronto Stock Exchange and the headquarters major Canadian banks to decry what they called government-abetted corporate greed. Protests were also being held in Montreal and Vancouver. In New York, protesters marched on a Chase bank to protest the role banks played in the financial crisis, and demonstrations were culminating in an "Occupation Party" in Times Square. Support for the anti-capitalist protest movement was light in Asia, where the global economy is booming. In Sydney, around 300 people turned out, while another 200 people in Tokyo chanted anti-nuclear slogans outside the Tokyo Electric Power Co., which operates the tsunami-hit Fukushima Dai-ichi nuclear plant. In the Philippines, some 100 people marched on the U.S. Embassy in Manila to support the Occupy Wall Street protests.